We're thrilled to announce that we've been recognised as Auto Enrolment Provider of the Year for the second year running at the FT Pension and Investment Provider Awards. Rosy Anand, Marketing and E-Commerce Director, commented "We've led the way from the beginning with our innovative proposition and high standard service levels, helping some of the UK's largest businesses to auto enrol. Winning this award two years in a row cements our reputation in the market as auto enrolment experts." 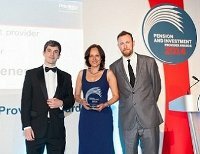 Run by FT Pensions Expert, these prestigious awards are judged by a panel of industry experts and recognise excellence among providers of products and services to the UK workplace pension schemes. We were also shortlisted for Mastertrust Provider of the Year. Winners were announced at an exclusive black tie dinner at the Sheraton Park Lane Hotel hosted by comedian Alex Horne. It was also great to be able to celebrate along with our colleagues at Legal & General Investment Management who won on the UK Property and Smart Beta Investment awards.